Yesterday we announced that Kind HEAVEN, the immersive entertainment experience opening next year on the Las Vegas Strip, will integrate blockchain technology using the NEM platform, with Asta as its official development partner. 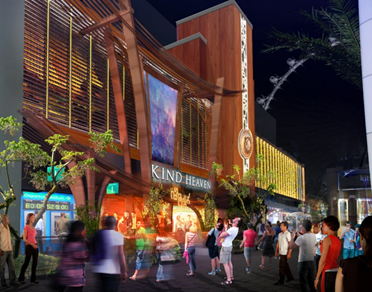 Kind HEAVEN is a groundbreaking destination and revolutionary movement combining cutting-edge RF technology (wearables) with Hollywood-style storytelling to transport audiences to a new world where they’ll experience the best of Southeast Asian culture, art, music, food, and fashion on and offline. This is a community, unlike anything experienced before. The team behind Kind HEAVEN. Cary Granat is the CEO of Immersive Artistry; Ed Jones is the award-winning visual effects pioneer for movies such as Who Framed Roger Rabbit and Happy Feet, and Perry Farrell is the lead singer of Jane’s Addiction and founder of Lollapalooza. Another way to think of this team is as “experience collectors” — the ones who inspire adventure and discovery. And now they’re sharing this with you, me, and the world starting in the Fall of 2019. Courtesy photo: Rendering of the front entrance of Kind HEAVEN. Due to the blinding heat of Las Vegas, I close my eyes outside the Linq hotel which also happens to be the 100,000 square foot future home of the $100M project known as Kind HEAVEN. 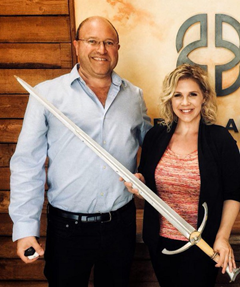 Cary Granat, CEO of Immersive Artistry, and Alexandra Tinsman, Regional Head of NEM North America. I open my eyes briefly and immediately recognize Cary Garant standing in front of me. “Hi Alex,” he says. “You ready?” I nod, but truthfully, Vegas is always sensory overload for me. I’m not sure what to expect next. Fast forward six hours. There’s no way I’m going to fall asleep after visiting the venue and talking with this team — specifically about blockchain’s role in the project. It surpassed what I envisioned this community would be. Much of what the team wants is a perfect fit for NEM’s plug n’ play blockchain technology. They need a proven, fast, safe, and secure hybrid blockchain to track global collectibles (a $600 billion market) as well as digital marketplace items, virtual collectibles, and more. Kind HEAVEN is focused on developing a digital collectibles business using blockchain technology that will capitalize on its mythology, characters, icons, and geography. In short, they need a trusted blockchain partner that can help them successfully bring this project to life. That’s NEM. Courtesy photo: Rendering of Kind HEAVEN. Kind HEAVEN offers a customized experience that changes from day-to-night. Many of the items for sale in the marketplace are tracked on blockchain, and even the RFID enabled wearable bracelet becomes the fast-pass for buying unique things (including music and digital content) that are genuinely sourced from global vendors, not sweatshops. As a result, the proceeds are tracked back to their original origins, which is an important part of the evolving Kind HEAVEN franchise. 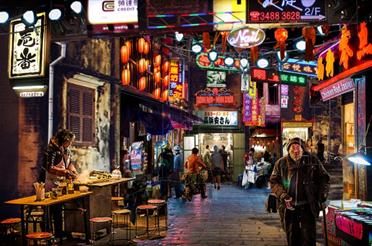 Courtesy photo: Rendering of the Kind HEAVEN’s marketplace where items sold will be tracked on blockchain. My journey might begin as a mom taking her kids on a family-friendly outing where my children get immersed in hidden Forest Temples brought to life with holograms and animated animals. No doubt my kids will be gleefully exhausted by learning hands-on about new cultures or charmed by fantastical street performers. All the while, we’re supporting Southeast Asian communities in meaningful ways and we’ve never left the Linq hotel. We’ll end the day watching an all-ages show and enjoying food fare from remote parts of Asia that none of us knew existed and probably can’t pronounce. We’ll love every minute of it because this is the team that knows how to bring beloved top entertainment franchises of more than $10 billion in box office revenue to the real-word. I anticipate kid meltdowns will begin the moment I try to wrap up our day at “Kid HEAVEN” (I mean Kind HEAVEN). My kids will want to stay because who wouldn’t want to linger long in a magical place like this? Which is the reason I return with my husband later that same night without our children. 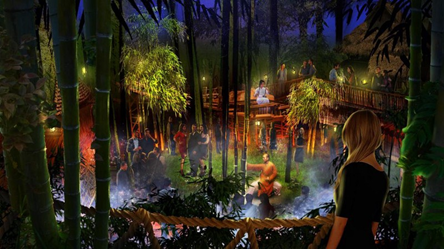 Courtesy photo: Rendering of the Kind HEAVEN nighttime bar scene. 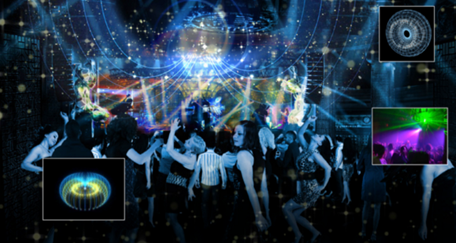 Nighttime in Kind HEAVEN is a walkable 360-degree immersive paradise complete with a multitude of curated adult entertainment shows and music venues highlighting top performers and emerging bands. 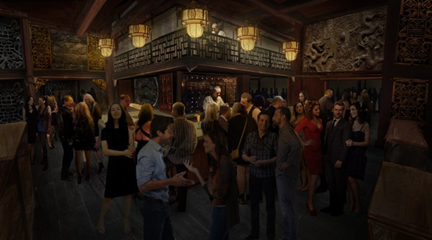 Courtesy photo: Rendering of one of six Kind HEAVEN music venues. There’s a mix of weekly food and drink specials that are only found in the most remote parts of Southeast Asia. For those more adventurous, there are dance floors that engage your senses and also your RFID wearable device. Another favorite part might be the tucked away sanctuary spots where down is up, up is down and time is forgotten. This is the kind of multi-sensory experience that becomes your go-to every time you’re in Vegas because it doesn’t adhere to the typical cheesy Vegas strip roadside attraction. Nighttime in Kind HEAVEN feels like you’ve transported to the early days of Burning Man mixed in with a remote Southeast Asian bizarre topped with your beloved favorite performers from Lollapalooza. It’s wild, innovative, fun, exposes you to new food and entertainment as well as connects you with a like-tribe community. Considering the powerhouse team behind Kind HEAVEN and the entertainment legacies they’ve brought to life for millions of people around the world, it’s the kind of community that all of us at NEM and Asta are happy to join. To learn more, visit www.kindheaven.com. Immersive Artistry (IA) believes the future of entertainment is about the creation of immersive, multi-sensory, communal experiences that will transport audiences on journeys both shared and unique. 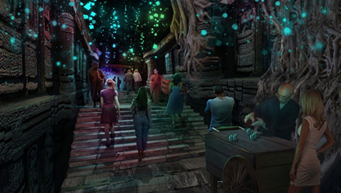 The company combines state-of-the-art technology with Hollywood storytelling to create extraordinary 360-degree experiences that involve all the senses. 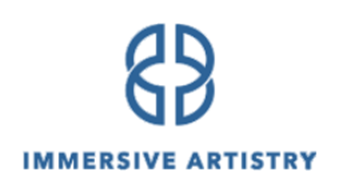 Immersive Artistry is headquartered in Los Angeles. The NEM.io Foundation is a non-profit organization based in Singapore, set up to promote NEM’s blockchain technology globally. It is currently one of the most well-funded and successful blockchain technology projects in the cryptocurrency industry. Founded in 1999, Asta has grown to be a leading End-to-End IT services provider across Australia and New Zealand. With a solid track record of business growth underpinned by a strong people culture and excellent relationships with business partners and clients, Asta has flourished into a multi-faceted IT solutions business.